Kulitis – Scientific name: Amaranthus spinosus L.
Amaranth, common name used for plants with blossoms that do not readily fade when picked, but especially for about 50 species of one genus found in the Tropics and temperate regions where many are widely naturalized. They are herbaceous annuals with simple leaves, and flowers in heads or spikes. The spikes are sometimes several centimetres long. Love-lies-bleeding has dry red bracts that surround the flower which allows them to retain their freshness for some time. For this reason the plant is a symbol of immortality. The annual tumbleweed of the United States belongs to this genus. The globe amaranth, of the same family but a different genus, has purple flowers that retain their beauty for years. Scientific classification: Amaranths belong to the family Amaranthaceae. 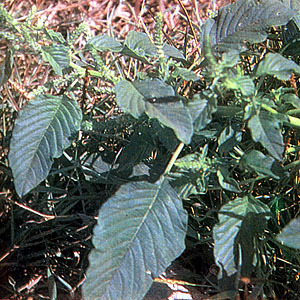 Love-lies-bleeding is classified as Amaranthus caudatus, tumbleweed as Amaranthus graecizans. The globe amaranth is classified as Gomphrena globosa. This entry was posted in List of Medicinal Plants in the Philippines and tagged amarath, kulitis on March 20, 2009 by Pinoy Herbs. Kulitis grows in my garden profusely. Before, I thought it was just one of the many varieties of grass until my neighbor, an old woman who is in her 70’s. told me it is a vegetable. And I believe many treat it as such – as another type of grass because it grows everywhere there is soil: on the roadside, around the tree, beside the fence and, yes, even around the trash. When I checked out the internet, indeed, it is a vegetable – and a very nutritious one which is good for the body and helps a lot in curing many kinds of illnesses. I would suggest that our government – the schools included – to acquaint our people about kulitis. It is not hard to grow. There’s no need to put in fertilizer to make it robust. I add kulitis whenever I cook pakbet. Also, I put it in instant noodles and ginisang sardinas and tinapa. It is edible, indeed. A friend gave me a bunch of it with huge leaves, told me it was Filipino spinach. I didn’t recognize it so I let it wilt and dump it. She visited me again with another bunch so I asked her what it is called in Tagalog. I was surprised when she told me it was kulitis, because the kulitis I had known as a young girl had tiny leaves. So I cooked it and when it started boiling, sure enough, the aroma of kulitis that I grew up with took me back to my childhood days in Makati, Philippines. What amazed me also was the medicinal purpose of this dark, green leafy vegetable. With that said, I stuck a stem in water for rooting so I can plant it in my little backyard here at the High Desert of Southern California. I’ve seen this plant grow in my friend’s backyard so I know how much kulitis I will have for life if that little stem roots and grows. Ah, kulitis, glad to meet you again after decades of separation. I have small garden in my backyard and this Kulitis is always growing and competing with my plants.Ialways discard it knowing that it is just a grass.When my cousin visited me he saw me pulling out the Kulitis and he told me to let them grow because it is edible.He said it coul be added to ginisang monggo or could be added to ginatang manok.Then i started to read about it.I found out that Kulitis is nutritious infact today it has been used as ingredient in some food supplement. kulitis is such a nutritious vegetable. it is so high in Vitamin A,C, and Iron..and a cup of kulitis a day can supply a Filipino daily nutritional needs of Vitamin A,C, and Iron.i am a 3rd year student taking up nutrition and dietetics at Philippine Normal University and i have conducted a research study of utilizing kulitis in appetizers as a source Vitamin A,C, and Iron supplement. and it has gone through acceptability and sensory test, and it is acceptable. i hope more Filipinos will become more interested in nutrition. I don’t know about anything about this plant until my wife just collected wild leaves from our backyard and cook this and educate me about its inherent5 minerals. After that, I began to feel like Popeye. Kulitis grows in my garden profusely. Before, I thought it was just one of the many varieties of grass until my neighbor, an old woman who is in her 70′s. told me it is a vegetable. And I believe many treat it as such – as another type of grass because it grows everywhere there is soil: on the roadside, around the tree, beside the fence and, yes, even around the trash. Kulitis is very common to us Ilokanos in the province it is called kalunay or kalkalunay in our dialect.There are many varieties of this plant, but in our province the native green with thorn and without thorn is plenty. It is not planted it just grow into our farm, backyard or anywhere where the seeds maybe blown by the air. We cook it half cook and eat it with tomato and bagoong(salted fish) or vinegar and bagoong. It can also be mix with mongo/beans/sardines and others but the best way to cook is just cook half cook. I’ve been eating green leafy vegetables since I was a child. Now that I have advanced in years, I have become so conscious of my food intake. While reading a book on cooking, the vegetable kulitis caught my interest. So, I decided to see more pictures of the plant. Wow! This plant grows in profusion at my place. They look just like weeds. Then I remember what my parents had told me when I was young that most Ilocanos eat this kind of plant just like saluyot. Now that I have learned how rich and nutritious this kulitis plant is, I will find time to really prepare a recipe on this. I will explore into making beverages or desserts from it. I just met kulitis a couple of weeks ago from a new-found friend.she’s bringing home some leaves which she washed and put it in the sinigang.i asked her what kind if veggie was that?she told me kulitis and she just plucked it from the roadside.when i ate it,it tastes delicious and she told ne that it’s also nutritious.now,i have an idea already,instead of buying those super expensive kangkong and pechay or malunggay (thank God i planted my iwn malunggay),i will use kukitis coz it’s very abundant here in Arizona….and it’s FREE! I have a lots of kulitis growing in my garden, some in my plant pots. I have a lots of seeds. Sometimes I use some kulitis leaves for cooking. Sometime I use it for salad. I can’t keep up eating is boreng sometime.